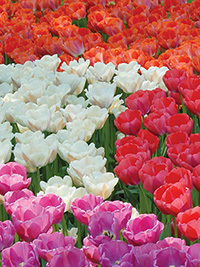 These varieties are selected from the toughest Darwin Hybrid tulips and Single Late tulips. And they will still be flowering years from now when you start with these top sized bulbs. You choose the colour and quantity. Select the colour and pack size required below.